Order 121 Hidden Online Jobs Today! 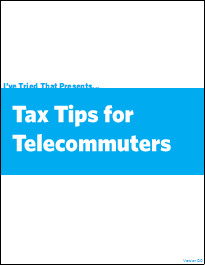 45 pages of pure telecommuting goodness. Learn HOW to land a legitimate, well paying work from home job, tailor resumes to telecommuting, and how to communicate with potential employers. The Complete Guide to Telecommuting will be the only "go-to" book you need as you make the transition from out of office to home office. Basic tax deduction that will save you money. Why your tax is higher and what you can legally do about it. How your self-employed income works with the rest of your return. Teach you how to quickly spot which online job postings are scams. Give you real life examples of scams that are being used TODAY. Save you thousands of dollars and/or your identity from falling into a scammer's hands.